I will offer reviews of applications but probably not until the tail end of next week. I have taken the Oath. Trait: I honor my goddess through practices that are foreign to this land. Trait: Far from home and nervous. I am reserved, cautious and respectful. Ideal: I trust that my deity will guide my actions, I have faith that if I work hard, things will go well. Bond: So long as I have this token from my homeland, I can face any adversity in this strange land. Flaw: I am convinced of the superiority of my own culture over that of this foreign land. A work in progress obviously. the concept is an elf who witnessed the priestesses first hand 200 years ago and devoted her life to Evelyn. She would be inherently good and innocent, but I imagine as an elf it would be hard to convince others of that. id like to see how the kingdom reacts to an elf girl as she tries to prove her good nature. A wise person once told me, "Always apply to a tomplum game." I got a chance to jump into this one a couple of months ago, and it's an excellent game. There are a few different groups operating, and I'm really interested in whether they'll interact someday, and how. I am getting back in the swing of things, I am sorry for being such a flake this year. It's been a rough one. Would you allow the 5e Ebberon Favored Soul Archetype? Last edited by Jat; 10-09-2018 at 02:37 PM. @ Jat - Here's what I found on that archetype. If my understanding that at first and sixth level you're taking the cleric domain abilities instead of sorcerer abilities, I don't have a problem with it. Its like a cleric with meta magic. I was worried about lossing the arcane side of the spells, but now looking back all she would cast anyways is necro cantrips, inflict wounds, bane, command. Only hesitation is limited fired magic. Last edited by Jat; 10-09-2018 at 03:18 PM. Last week for application submission if anyone else wants to throw their hat in the ring. Character Concept / Background Sasori belongs to a tribe of desert druids. Life in the desert is hard, and the tribe has fallen on hard times. Himself with a wife and a young son, he must leave them behind with the elders of his tribe as one of the young, able-bodied men sent off to find work to feed the families of the tribe. Sasori's focus as he progresses in Druid capabilities will be the Wild Shape ability, specializing exclusively in Scorpions ('giant' scorpions) and pursuing the Circle of the Moon path to maximize his effectiveness with this chosen combat technique. While traveling or among those he does not trust, Sasori wears the typical hooded robes of his tribe, which are colored desert yellow and serve to protect him from the elements - both the biting sand and the blistering sun. The special hooded attire includes a cloth face-mask which is essential for life in the desert as protection against sand-laden winds. When pressed to fight, he will often remove the outer robes and operate with just the combat vest & mask, which he wears underneath the cloth robes and head coverings. 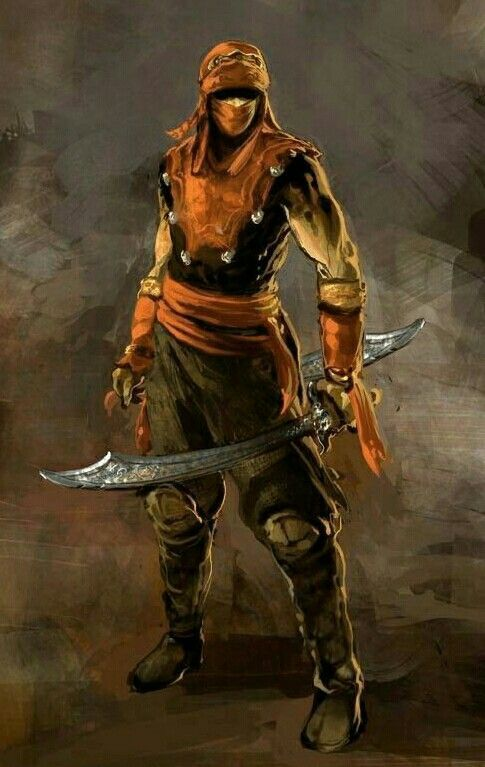 The vest and mask are also of desert yellow, in accordance with the color of his tribe, and are made of sturdy leather that serves as the armor to protect him against physical attacks. The inner hood is also a stiff leather, but black and more firmly fitting than the robed version. Although he caries a staff for travelling and defense, when pressed to fight he prefers his tribe's weapon of choice for offense: the Scimitar. Combined with his use of druidic desert magic, Sasori often employs a focus on fire for the defense of his self and tribe. Sasori also caries a special druidic focus: The dried tail of a scorpion, strung around his neck on a band of leather. This totem is a symbol of the druids of his tribe of their totem protector, the Giant Scorpion, which those skilled in the druidcraft are able to borrow the form for enhanced defense of the tribe. Physically, he has a tawny complexion and muscular build, which is hidden beneath his traveling robes but noticeable when stripped to his fighting vest. Standing at 6-feet and 4 inches tall, he weighs 220 lbs and strikes an imposing figure. Personality Overview: Above all, Sasori cares about his family and his tribe. Eking out an existence in the desert is grueling, and not for the weak. Although he operates under the strict honor code of his druidic tribe, their priority is the protection of the tribe first, knowing that the desert is the true master and does not truly need a 'protector', but that all beings must respect the desert and its ways. Those that do not, need not be in the desert (they may leave of their own volition, or forcibly - it matters not to the desert-dwelling sons of Osiris). Personality Trait: I place no stock in wealthy or well-mannered folk. Money and manners won't save you from a desert sandstorm. Ideal: Honor: If I dishonor myself, I dishonor my whole tribe (Lawful). Bond: My family & tribe are the most important things in my life, even when they are far from me. Flaw: I remember every insult I've received and nurse a resentment toward anyone who's ever wronged me. Doesn't let go of a grudge until the grievance has been repaid. Oh yeah, I'll be posting interest just so it doesn't close early. Gonna go with some fey-aligned bardic subversive. Viva la Revolucion! I'll get it up in pieces during this week. Alignment: Chaotic Neutral - Strength is earned, by blood, guile, allure, and effort. Through strength, the world comes closer to how it ought to be. In chaos, this strength is well and truly earned by one's talents. In order, that strength is ensnared and perverted. These are Drake's beliefs and any mean is suitable for these ends. Behind this worldview, however, is the key to Drake's heroic potential: a strong concern for the poor, weak, and troubled, which he is certain shall be better served when those at the top are brought low. The young man is tall, svelte, and dashing. If he were dressed in finer clothes, the village girls might think him to be a minor noble of some sort but, even in his threadbare clothes, there's something about him that catches the eye. Certainly the interested eyes of many potential suitors about this podunk, each wondering about his story and if they could figure into it. You're also checking him out right now, but for different reasons. You and your brother, bounty hunters of some renown working for Rhyfel, had been piecing together his trail for a while now, ever since his little group of circus-murderers got busted by the King's Men. Just a week ago you received a solid tip about his general location from a less-skilled hunter that he had evaded. Amateurs should really just stick it out as a city guard for a couple years before trying to play with the big boys. Oh well, their failures just become more leads for the two of you. Thofror followed up on the tip and, well, here you are - with the walking sack-o'-coins right in front of you. Turning your thoughts back to the present, your target flashes a sorry smile to a pair of girls who were asking him some question and heads on his way. As the trio breaks up, he makes a show of stretching, disguising a quick scan of his surroundings in the more conspicuous movement. Not bad, but you're better. Before his shifty green eyes can reach yours, you shift your gaze a few feet up to his left and take on an extremely bored expression. One sip, two sip, then gaze down into your cup. When you look up, he's already moving on, none the wiser. You leave a couple coins on the table and move to follow. You stalk him all the way to an abandoned building where he's probably been squatting. You creep your way to the front entrance, certain that Thofror has already made his way to the back of the building to cover the most obvious escape route. Peeking around the corner of the open doorway, you watch as he pulls out some sort of disc from his pouch. It's mostly golden in color, but other bright colors gleam here and there in a pretty, but confusing, design. At this distance, it's not easy to make out the fine details but it doesn't mesh in the slightest with the meager look he's been presenting so far. Something far beyond his station, obviously. Probably a treasure looted from one of the great men and women whose lives this scum has ruined. The boy opens it up and a warm, yellow light is cast upon his face from within the item. A magical trinket, it seems. Now that's even more interesting. Still, your target's expression is disappointed for some reason as he looks into the light. Well, his disappointment's about to get a lot higher. You step around the corner, weapon in hand, and clear your throat loudly. Half a second later your brother appears on the opposite end, ax in hand, grin matching yours. Jackpot. Whether it's having a friendly disagreement about which Orcish ruin has the best aesthetics, comparing sexual escapades with his buddies, or trying to decide which body parts should be cut and removed from a man in order to make the interrogation go as smoothly as possible, Drake is a pretty laidback fellow. There's a lot of messed up things in the world, so there's not much point in getting upset over all the little problems that make up our life. In fact, it's when things are at their worst, that the world is having its biggest laugh at your expense. So, you gotta laugh right back. Laugh and laugh and laugh - with your eyes, at least, if not your mouth. a theater show or circus. Desperation called for them to pose as a small company of mercenaries on rare occasion. Led by the eccentric "N," they wreaked havoc, both large and small, wherever they went - always to the detriment of the noble, the rich, and the powerful. The fate of their victims could be as painless as a simple recovery from an unsubstantiated scandal that had grasped the city's attention or as terminal as torture and death for wrongs perceived. Ever since Drake sought out and was accepted into the company of these agitators, he routinely participated in such criminal activities. Until, one day, their fortune ran out. Caught by a surprise assault, outnumbered four to one, the few that escaped did their best to scatter to the winds. Drake counted himself as one in those lucky numbers, even managing to steal away with N's prized pocket mirror, until one day his fortune, too, ran out. A series of stifled grunts was all that their fellow prisoner released as the angry crowd carried the man while also tearing him apart. There was a bit of blood on the cart where someone had eagerly stabbed the man, not patient enough to wait for one of the Bronzemantle brothers to undo the undercarriage mechanisms that threaded to the floor up to the shackles that bound them. "That was pretty wild," commented the younger man still in the cart with a soft, even voice. He sat on one of the benches, forced to lean forward by the lack of slack from his chains. He smiled at the other man, who went by Cadogan, opposite him but also leaning forward. The young man's eyes twinkled and he looked as though he was either just about to tell or just had been told a funny joke. The dwarves, their captors, returned to the cart and the cart began to move again - slowly at first, then picking up speed. The young man raised his voice a bit to be heard by the dwarven brothers as they left the town and made their way on to the back of the road. "What'd that guy do to receive such a warm welcome home?" The Bronzemantles ignored Drake's question - as they had most everything the young man had to say - but Cadogan decided to speak up, once he stopped looking in the direction of the town that was receding in the distance behind him. With a bit of a drawl, he told Drake, occasionally making what little motions he could with his hands while shackled to the floor, "Well, rumors say that a lot of daughters have been missing from Morynhill these past few years. Ended up in pieces. That, was the guy. He was dropping hints when we were talking before too. A devil and a creep, that man." "Ah," said Drake flatly as his eyebrows lifted just a little in mild surprise, "I wouldn't have thought that, looking at him. He could have been my sweet grandpa." "... Right. Kid, you don't exactly fit a look either, sitting dainty like that. What's your story, while we're at it? You heard me tell Mister Morynhill Murderer my story, but you didn't say a damn word over there. Just smiling." Cadogan looked a little bothered from the preceding events and Drake was getting the brunt of these bad feelings. Ah, damn it all. Alright, I'll level with you, since I know no one's coming for me. Or, at least, if they do then they're foolish enough to hang right alongside me. As for what I've done.... Well, I honestly don't remember what I'm being charged for. Murder? Kidnapping? Arson? ... Definitely, those, at the least. Maybe ask one of the Bronzemantles on our next stop. Long way to back to the Capital, right? Or maybe you're getting 'dropped off' sooner?" Drake winked at his companion in the back of the cart and laughed a little at his joke before stopping, leaving the cart in silence. Cadogan frowned back and kept his mouth shut, deciding to leave the nut alone. Last edited by PeasOfCrab; 10-20-2018 at 12:06 AM.